Zero 88 are proud to become the first manufacturer to support multiple Numeral Systems within their lighting consoles, through a new version of their popular ZerOS operating system. 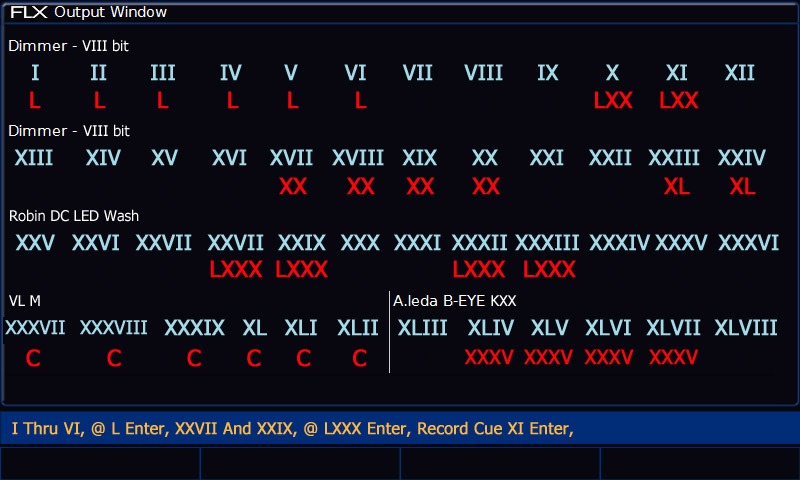 Version 7.9 of ZerOS, being previewed at Prolight & Sound in Frankfurt, allows users to switch from the current "Hindu–Arabic numerals" view to a new "Roman numerals" view. When chosen, a secondary option allows the user to switch between "traditional notation" and "subtractive notation" (where "IV" will represent four, opposed to the more traditional "IIII"). Zero 88 General Manager David Catterall mentioned "Studios and Production Houses make up a large segment of our customer base - this is a core group of users already familiar with using Roman Numerals within their credits on a daily basis". To support the release, FLX hardware has been updated, replacing keys 0 - 9 with I, V, X and L. Pressing @@ will now represent "C" rather than the more confusing "full". Jon Hole, Zero 88 Product Manager, explained "being able to reduce the antiquated 10 numeral keys to just 4 symbols will make FLX even simpler, easier and quicker for our end users - we're sure our customers are going to love it!" ZerOS 7.9 will be previewed at the upcoming Prolight & Sound exhibition in Frankfurt, Germany, 5th - 8th April, 2016. Zero 88 will be in Hall 3.0, Stand B50.